Video footage of Pyotr Kropotkin's funeral which took place from 10th to 13th February, 1921. It was documented by 'Section of social chronicles of all-Russian cinema and photo publishing'. Pyotr Alexeyevich Kropotkin (Russian: Пётр Алексе́евич Кропо́ткин; 9th December, 1842 – 8th February, 1921). From 0:33 onwards you may see organising commission for the funeral, which included a number of well known anarchists at the time - Sandomirskyi, Perovskyi, Lebedev, Yarik (0:49), Askarov, Pavlov, Atabekyan (01:00), T. Shapiro, A. Shapiro, Alexey Borovoy, Piro (01:11), Gogelio, Maximov, Markus, Anosov, Chernyi (1:31) and Aleksandr Berkman (01:45). Following is the funeral procession in Dmitrov, special procession train to Moscow and farewell in the house of the trade unions, where at 6:40 you may see Emma Goldman and Alexandr Berkman. .
Perhaps the most touching moment of the documentary is at 7:40, which is footage of anarchist political prisoners temporarily released in order to attend the funeral. A number of them never had another free day in their lives. 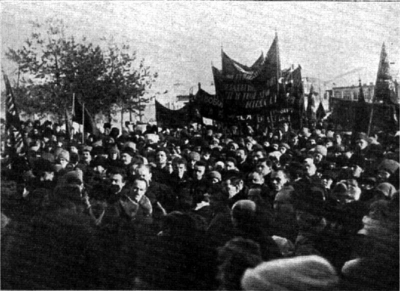 Kropotkin's funeral was also to be the last public demonstration of anarchists in Moscow until 1988. Finally, from 9:36 there is footage of speakers at Novodevichy cemetery on 13th February. These are Sandomirsky on behalf of anarchist organisations, Schteinberg on behalf of left-wing socialist revolutionaries, Pavlov on behalf of anarchists, Mostovenko on behalf of the Communist party (official authorities could not afford to ignore such an event), Ermansky on behalf of the Social democrat mensheviks, Rosmer on behalf of the communist international, Emma Goldman on behalf of American anarchists, Pevin on behalf of Moscow students and Baron on behalf of the Ukrainian anarchist federation 'Alarm'. Very somber muzik. Interesting video overall. great to see the american banner.